Hailing from Denver, Colorado, Jerome Luke is a singer and songwriter who has his own, unique take on Americana music. Jerome is a very eclectic performer whose work is really hard to categorize and classify within one single genre, incorporating the most disparate influences, ranging from rock, to country, folk and pop. Acoustic rhythm guitars are topped by a powerful bass groove and great solo electric guitars, in the best tradition of bluegrass and electric country. All the music is held together by Jerome’s trademark deep and expressive vocals. The singer is blessed with a very recognizable and one-of-a-kind voice, warm and bright all the time. This versatile performer is in fact able to reach the powerful low growls of a Johnny Cash at his best, as well as rising his singing higher, to create a wonderful emotional climax in every tune. His entertaining and tireless sound makes him an intriguing artist. 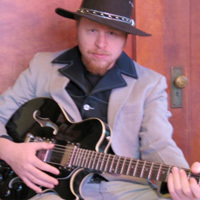 Jerome Luke began writing, singing and playing bass at the age of 15. He formed two indie rock bands with his brother, Time Well Spent and Man the Moon. Several albums were released. He more recently found a passion for writing and composing songs best described as 'Americana', however his rock roots shine through. His soulful, deep voice and guitar playing are a real treat and fresh sound. Catch him live if you can and bookmark this artist as more tunes will be posted in anticipation of the release of his upcoming debut solo album.